Day 1 - Thursday 5th July. It was a very hot, sunny day. 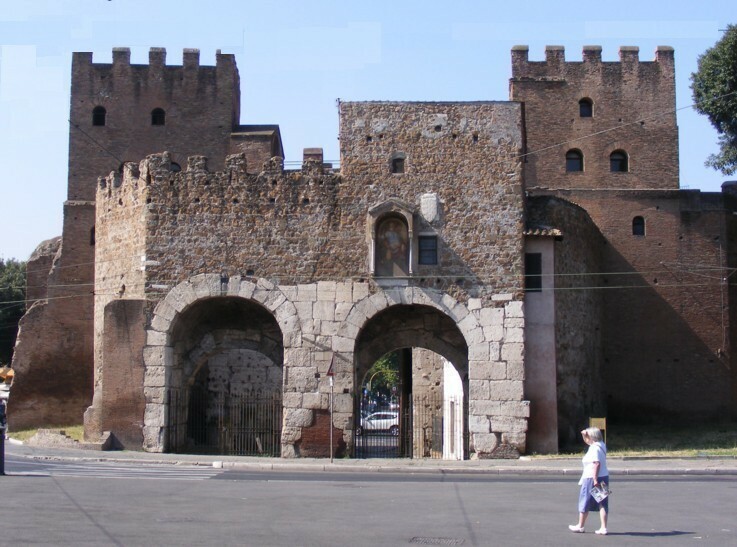 Our objective today was to look at some of the ancient Roman ruins and we started by taking a bus to Porta San Paolo to look at three things - the Porta San Paolo and attendant city wall, The Pyramid of Caeus Sextius, Monte Tesstaccio. Below are some of the photos taken to illustrate the walk. 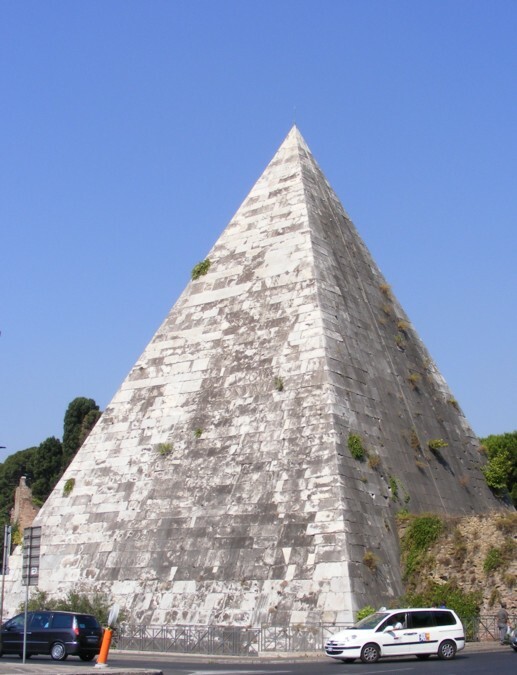 This funeral monument is usually know as 'Piramide' and lies just outside of the city walls, right by Porta San Paolo. 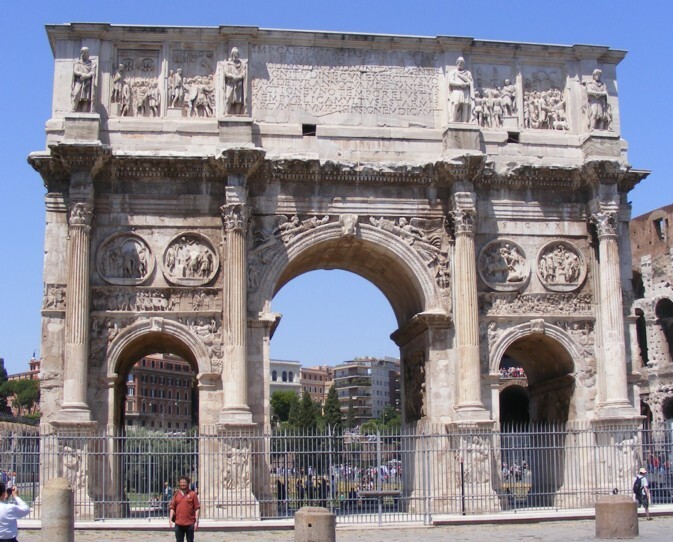 It was built about 20BC. 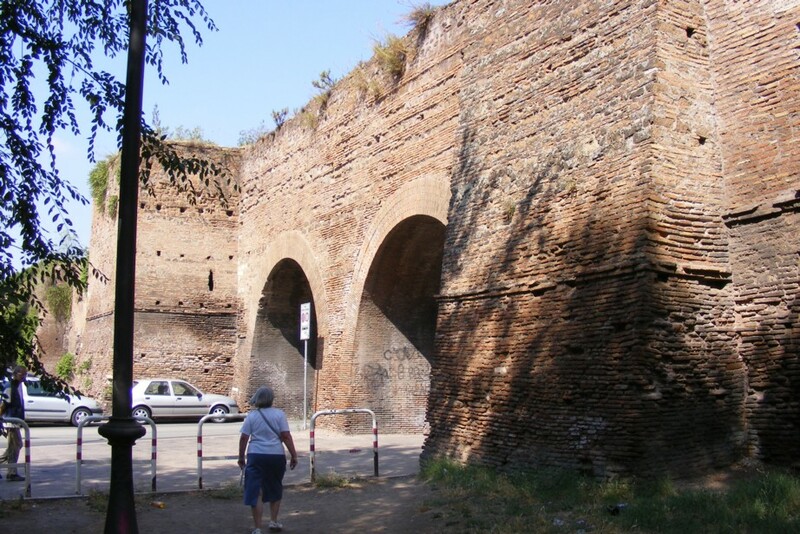 Near Porta San Paolo, this stretch of Aurelian City Wall has been modified by inserting modern large arches to allow traffic to circulate. 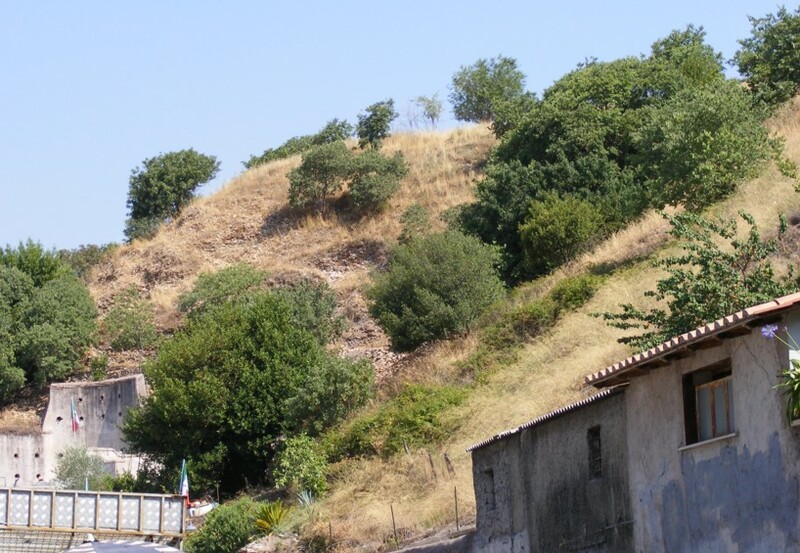 This massive mound, covering several acres, is composed of redundant amphorae, mostly used for olive oil and garum. They could not be reused and were carted from the city to make this mound. 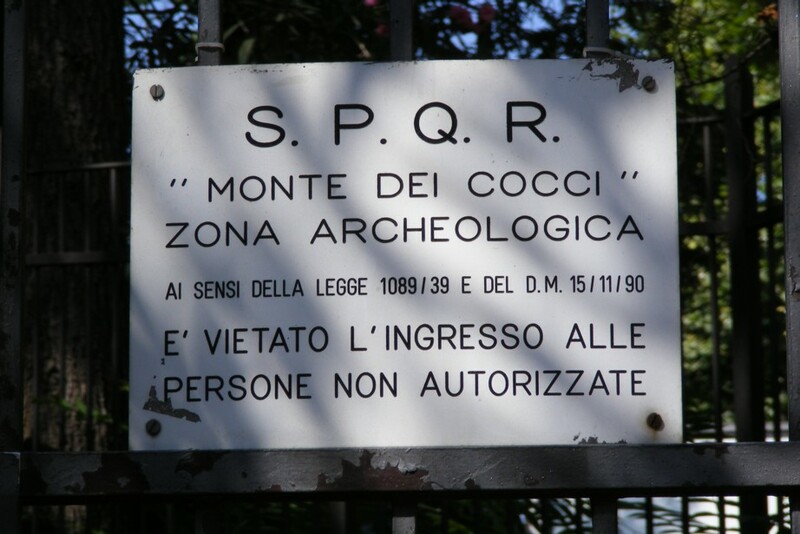 The mound is entirely surrounded by buildings, and this entrance in one corner is the only way in for research. General public are not allowed in. 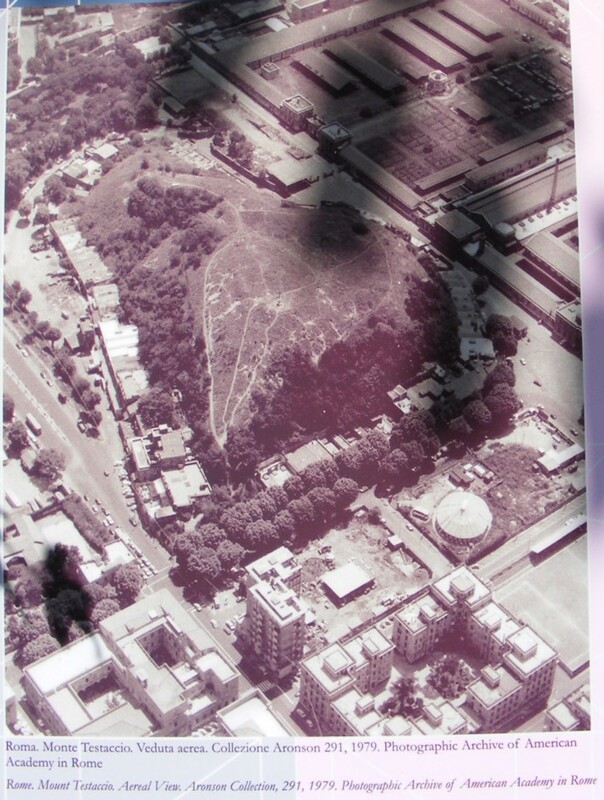 An aerial photograph on a display board by the entrance. It gives an idea of the size of the mound compared to some of the apartment blocks close by. 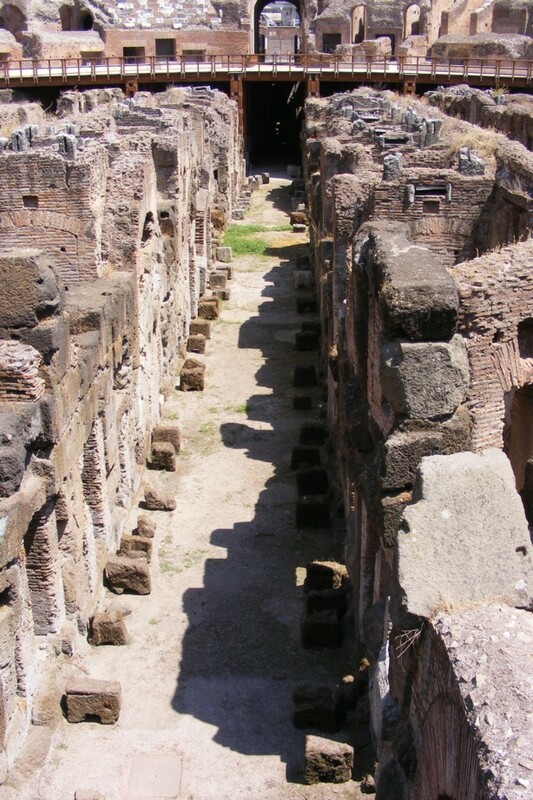 We walked back to the entrance to the Palatine and Forum. 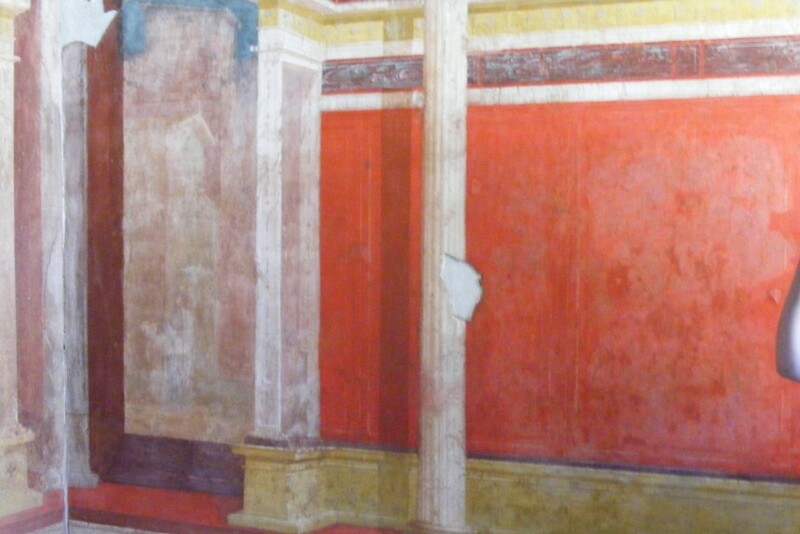 We wished to look at the House of Tiberius and any other places we could manage before exploring again the Roman Forum and the Colosseum. 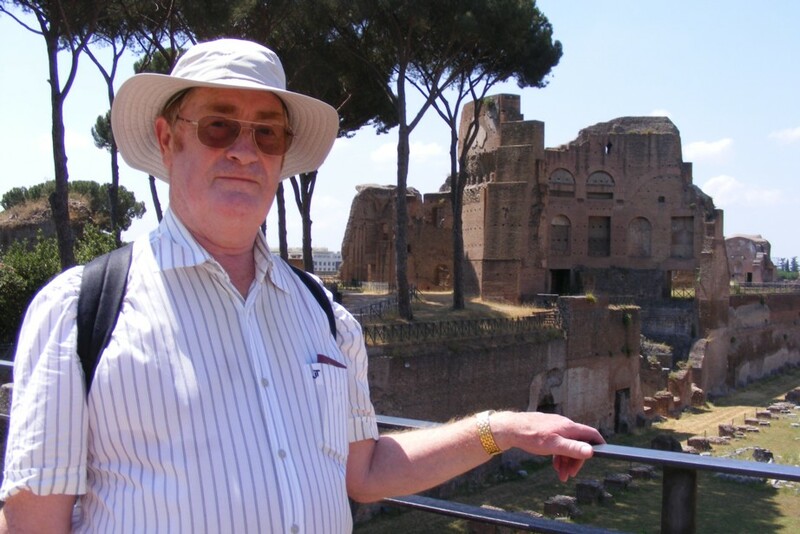 Pictured with the Stadium of Domitian behind him. 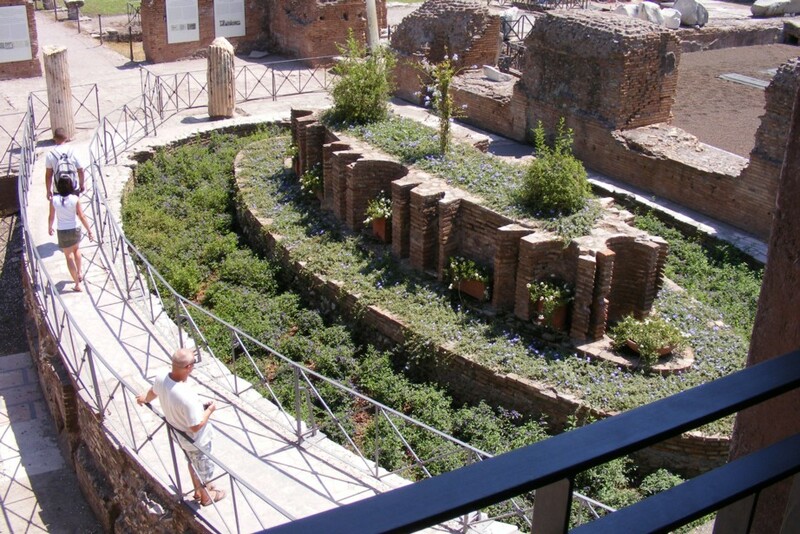 The garden feature may be later than the Augustan period. These are now protected by a much more modern building. 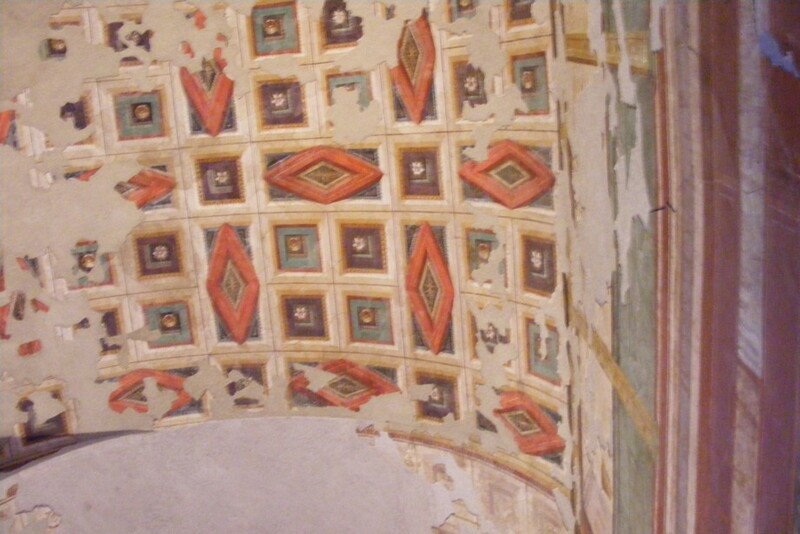 Ceiling decoration in a low level room of the palace. 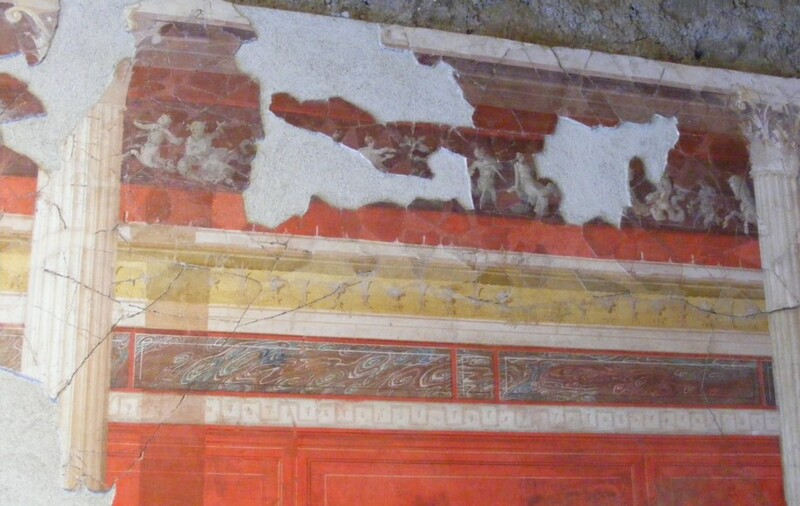 Wall decoration in the low level rooms. Many are protected by glass. 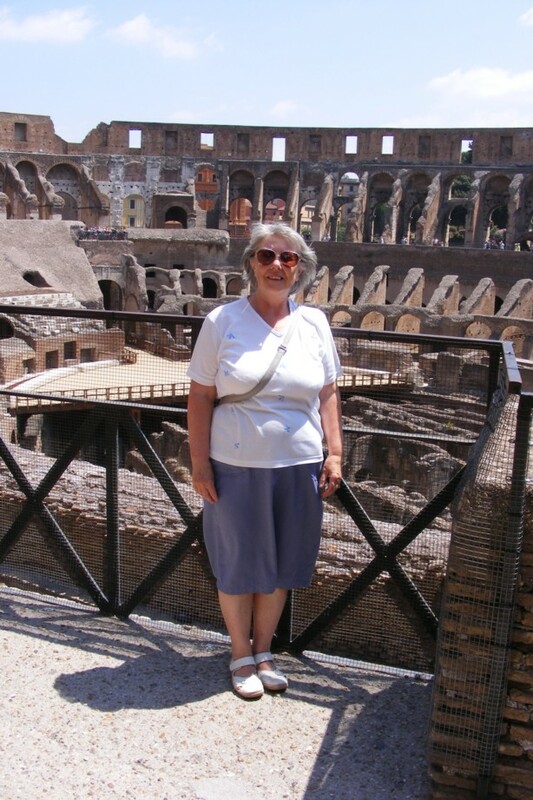 We continued on to the Colosseum and a few photos show what we saw. 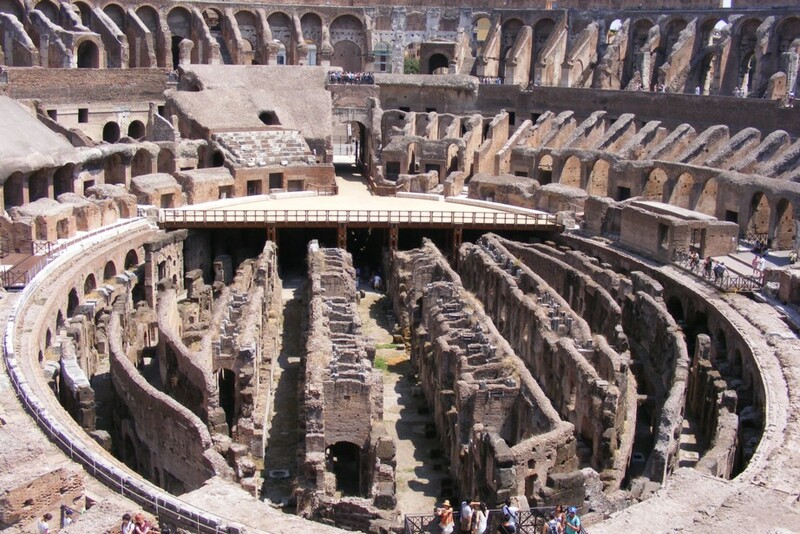 This image shows the arena, the floor has been lost so the underground structures can be seen. Close up of the central underground road. 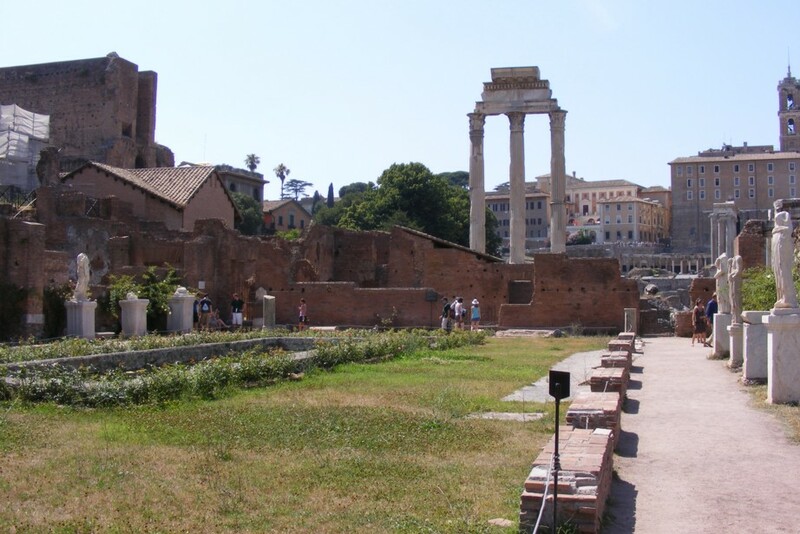 The last area to explore in the day was the Roman Forum. There is much to see and we only include a few images. 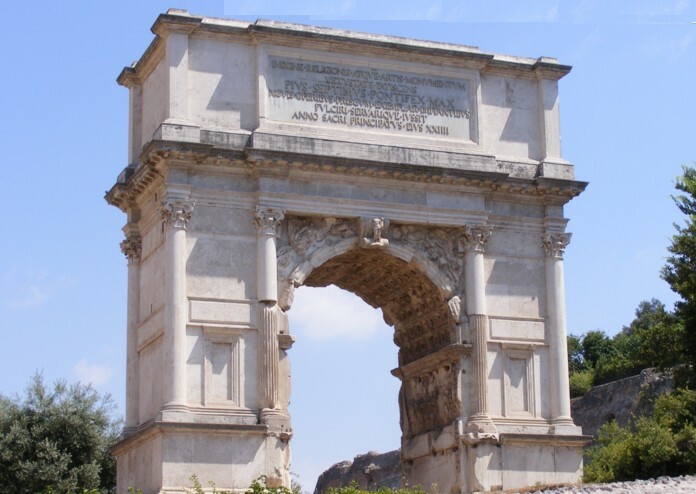 Commemorates the crushing of the Judean revolt by the Flavian Emperors - Vespasian and his oldest son Titus. Looking along the garden towards the Capitoline Hill. 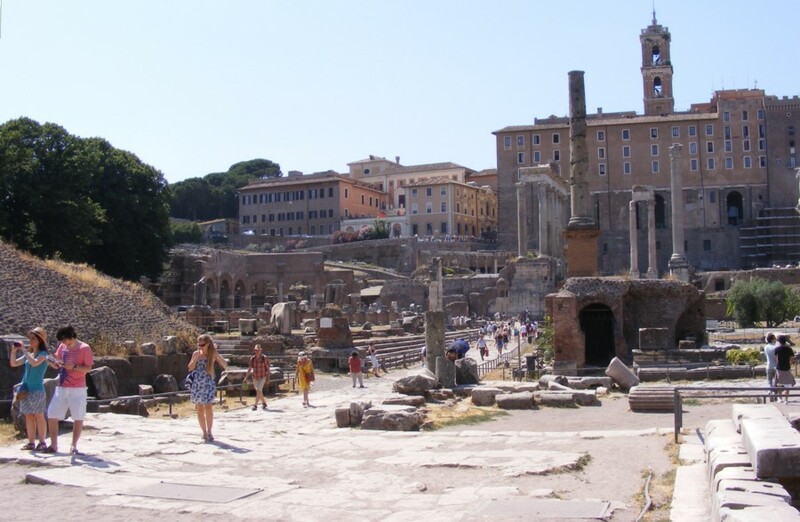 View from near the House of the Vestal Virgins, looking towards the Capitoline Hill. 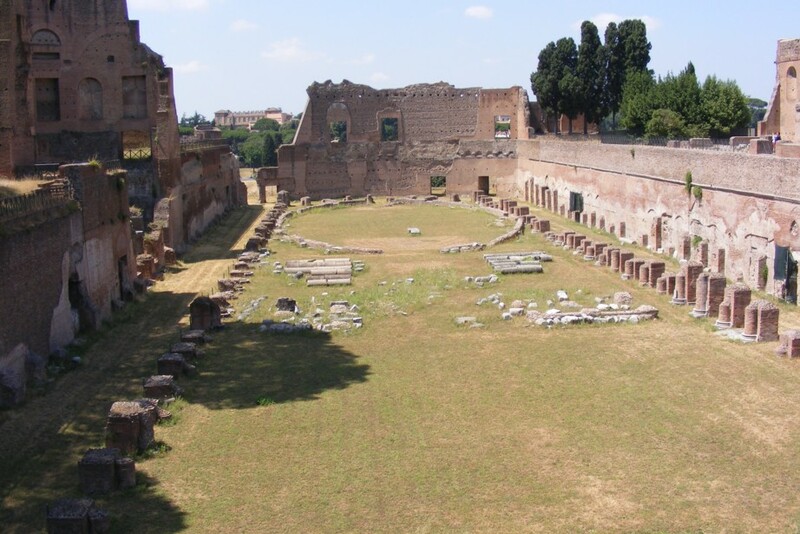 The Basilica Julia is on the left. 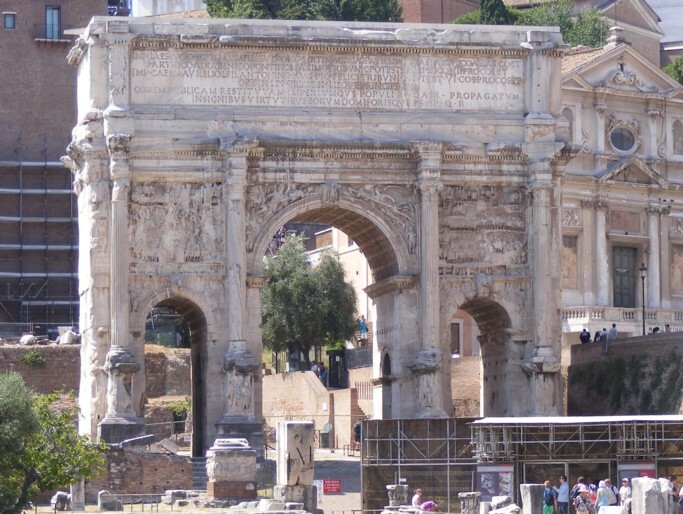 Erected in honour of Emperor Septimius Severus who reigned 193 to 211AD and died of natural causes in York. 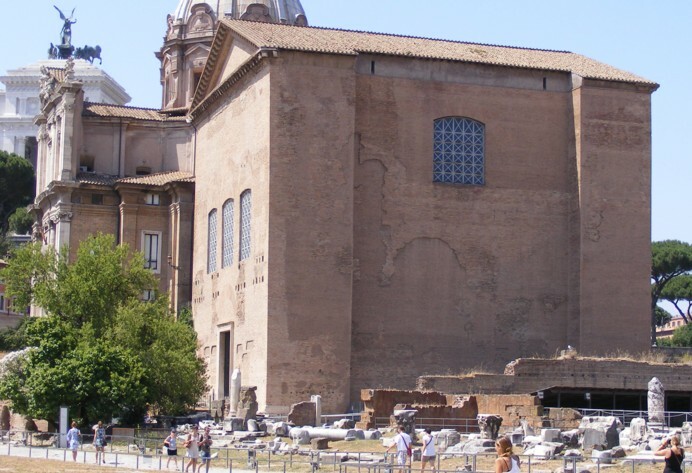 The Senate building, The Curia, is surrounded by builders' huts and fences and we could not get near it. 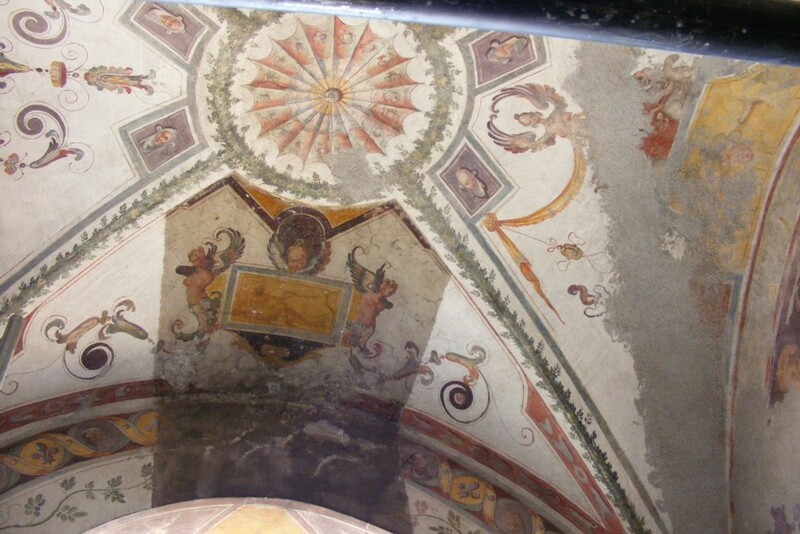 We have been in the entrance to the building some years previously. Now surrounded by metal fencing to deter vandals. 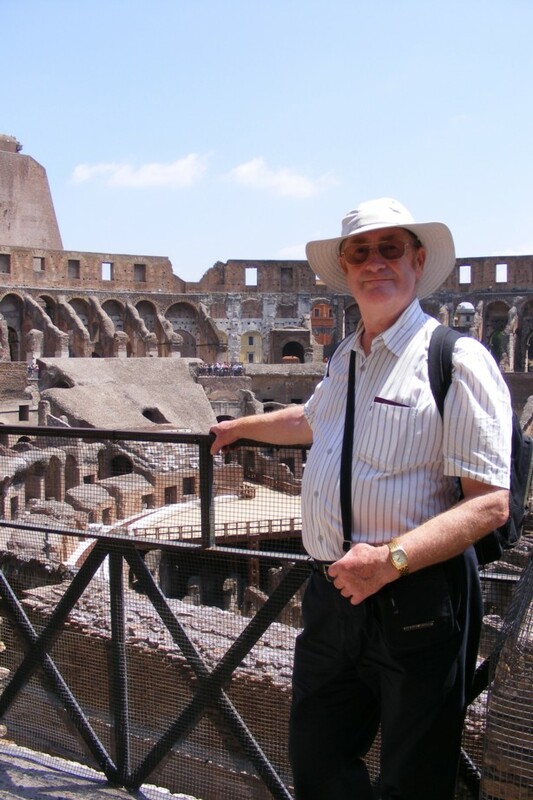 It stands on level ground between the Colosseum and the Palatine Hill.